The Global Volcanism Program has no activity reports for Tahual. The Global Volcanism Program has no Weekly Reports available for Tahual. The Global Volcanism Program has no Bulletin Reports available for Tahual. Deeply dissected Volcán Tahual rises ~700 m above plains S of the town of Monjas. The summit of the forested stratovolcano is cut by a broad erosional crater that extends to the base of the volcano and is narrowly breached to the NE. A Holocene pyroclastic cone near the NE base fed a short basaltic lava flow (Williams et al., 1964). The scenic lake-filled Laguna de Hoyo lies to the N. This steep-walled crater and the NE-flank cinder cone lie along faults bordering a graben that extends across the eastern base of the volcano to neighboring Retana caldera on the SE. The Global Volcanism Program is not aware of any Holocene eruptions from Tahual. If this volcano has had large eruptions (VEI >= 4) prior to 10,000 years ago, information might be found on the Tahual page in the LaMEVE (Large Magnitude Explosive Volcanic Eruptions) database, a part of the Volcano Global Risk Identification and Analysis Project (VOGRIPA). There is no Deformation History data available for Tahual. There is no Emissions History data available for Tahual. 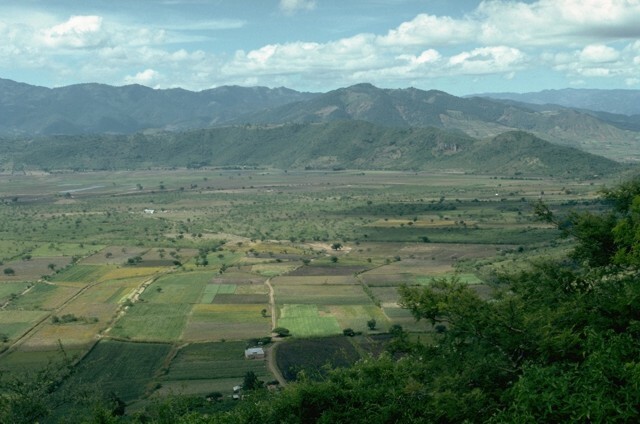 Volcán Tahual, seen here from the NE, rises about 700 m above plains south of the town of Monjas. The summit of the 1716-m-high forested stratovolcano is cut by a broad erosional crater that is narrowly breached at the NE base of the volcano (center). 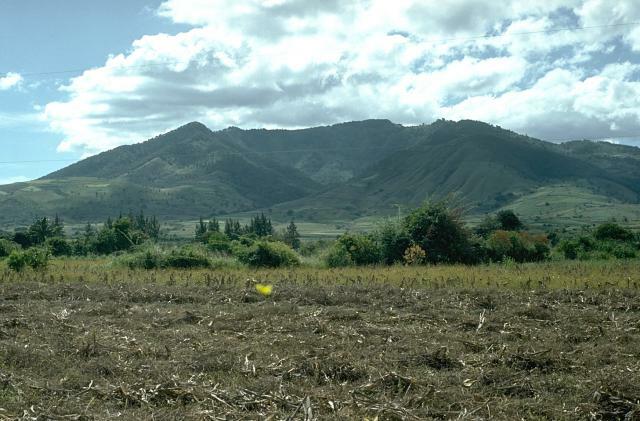 The volcano is deeply dissected, but a Holocene pyroclastic cone near the NE base of Volcán Tahual fed a short basaltic lava flow, which forms the lighter-green area in the sunlight at the right-hand foot of the volcano. There are no samples for Tahual in the Smithsonian's NMNH Department of Mineral Sciences Rock and Ore collection. Large Eruptions of Tahual Information about large Quaternary eruptions (VEI >= 4) is cataloged in the Large Magnitude Explosive Volcanic Eruptions (LaMEVE) database of the Volcano Global Risk Identification and Analysis Project (VOGRIPA).